Khepri meets the Pharaoh, Prince of Egypt, for the first time one morning in the shadow of the temple walls, and a friendship springs up between them. When Khepri discovers a terrible trap in the Pharaoh's newly-built tomb designed to kill, he knows he must warn the Prince. But how? For Khepri is just a small scarab beetle who scuttles along floors, among roots and into baskets of figs. How Khepri saves the Pharaoh's life and receives the highest honour of all is hauntingly told and dramatically illustrated in an original tale of ancient Egypt, which includes an historical end note on tomb-building and the Pharaohs. In the days of Ancient Egypt the god Ra created all things. Great or small, they were part of the circle of life and death. 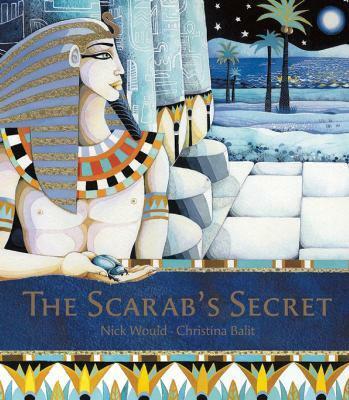 But who could have dreamt that a tiny scarab beetle would hold the key to the life of the Pharaoh himself? Nick Would's story, hauntingly illustrated by Christina Balit, spins the magic of tombs and temples into a web of mystery and intrigue. Christina Balit was born in Manchester but grew up in the Middle East. She studied at Chelsea School of Art and the Royal College of Art, and also attended Morley Theatre School and Questors Theatre School. She has exhibited widely and is also a playwright. Her books have won several nominations, commendations and a shortlist place for the Kate Greenway Medal. Kingdom of the Sun (written by Jaqueline Mitton), won the 2002 English Association Award for non-fiction. After three years of teaching, Nick Would moved to London to write song lyrics and children's stories. In 1992 his song Greyclouds, with music by Glen Morris, was chosen by the elephant charity Elefriends as its flagship song, then released as a single and nominated for an award. Nick now lives in Crouch End with his wife, textile designer, Maggi Waud.